The problem of evil presents a greater apologetic challenge to the Christian faith than any other. It is a hard thing to wrap your head around. How is it that God, who is by nature, all-good, all-powerful and all-knowing, could allow evil to exist in the world? It is pretty easy to affirm any two of those three characteristics at the same time and understand how evil exists. Consider if God was only morally perfect and all-powerful, but He was not all-knowing. In that situation, evil could clearly exist, and perhaps God simply was not aware of it. That dodges the problem of evil. If God was morally perfect and all-knowing but not omnipotent, He may know about evil and want to stop it, but it may be too strong. Again, that avoids the problem. If God is all-knowing and omnipotent but not all-good, then there is no reason to expect that you might want to eliminate all evil. Without moral perfection, there would certainly be no expectation that he would eliminate evil and therefore no problem of evil. The Christian faith cannot accept only two of those three characteristics though. Our God is indeed morally perfect, all-knowing and all-powerful. Therefore, we have to deal with the problem of evil. Other religions might not have to. When you think about the ancient Greeks, their pantheon of gods didn’t have any of these characteristics. Their gods did morally questionable things all the time, none of them were omnipotent as there always at war with each other and it was possible to deceive them implying they were not omniscient. Of course there is no problem of evil when you cannot expect your deities to do anything about evil. The Christian faith must answer this question, and G.K. Chesterton attempted to do so at the end of The Man Who Was Thursday. If you haven’t read the book, here is a very brief summary that will contain spoilers. The protagonist, Syme, is an undercover detective who is assigned to infiltrate an anarchist conspiracy. He joins the group by unseating a fellow contender named Gregory and consequently embarks on a mission to prevent an assassination. Needless to say, he encounters multiple obstacles on this journey, and at the end of the story, it turns out that Sunday, the chief anarchist, is also the one who had originally assigned Syme to join the anarchists in the first place in order to take it down. I understand from people who know a lot more about Chesterton than I do that there is a great deal of discussion as to what Sunday really represents, but Syme asked him questions at the end of the book that sound an awful lot like Job speaking to God about why he had to go through so many difficult times. Sunday’s answer applies to the real world problem of evil as well. This sounds very much like Satan’s accusation of Job. Of course it was easy for Job to be faithful because God had blessed him with family, wealth and general safety. We hear this accusation today as well. I have had people tell me that essentially they have personal disputes with God. They allege that God will a lot to answer for if He is real because of all the difficult situations they had to go through. That spirit of rebellion is embedded in this attack from Gregory. He hypothesizes that perhaps the reason for so much evil is that those who ultimately stand for what is right and need to be able to say that they did not receive any preferential treatment. Gregory is saying that Syme had an easy life, and he knows that that is untrue. This entire story documents the trials and tribulations Syme had to persevere through. Therefore, he supposes that perhaps the entire reason that he had to go through all of this suffering was so that he could stand up to the charge of Gregory. Gregory would not be the only one to lay claim to the virtues of bravery and courage because he was the anarchist. It would be problematic if the rebel was the only one who could espouse good virtues; those who embrace order necessarily needed to be able to lay claim to the same virtues. At this point, everyone understands that Sunday was the architect behind everything that took place. As a result, all of the struggles that Syme had to handle were a direct consequence of the situation that Sunday had put him in. In terms of theodicy, this is quite a bit like the situation that some would say God is in. How is it the case that God could put people in situations that cause them so much pain? Syme’s response is quite similar to what has been referred to as a soul-making theodicy. In other words, God allows trials to come into our lives because they help us develop into better people. 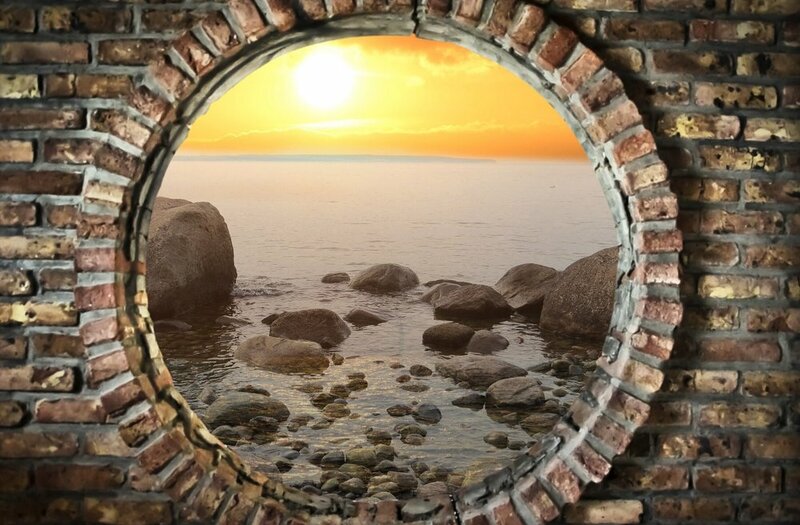 There are virtues that can only be cultivated sometimes by experiencing difficulty. Consider the value of courage. It has no value if it is never tested in a situation where one would need it. We don’t know we have it until we actually need it. Consider the value of sympathy. We could never develop our sympathy if they were never other people that we had to be sympathetic towards, and the only reason they need sympathy is if there is some difficulty they are experiencing. This idea of a soul-making theodicy is not Sunday’s response to the accusation. In fact, he never responds to Gregory’s charge whatsoever. His only response comes to a direct question from Syme when he is asked if he has ever suffered. This reference directly ties to the narrative dictated in Mark 10:37-40 (NIV). The implication is obvious. Sunday does understand suffering, and anyone who is going to follow him had to be prepared to do the same. Much in the way that Jesus Christ understood human suffering, Sunday understood the suffering of Syme. This doesn’t seem to be a straightforward affirmation of a soul-making theodicy though. Otherwise, he could have simply agreed that all of the suffering was to help Syme develop certain character traits. He only answers by asking a question. He asks if Syme can drink of the same cup that he did. That certainly points to the fact that anything that Syme had experienced up until that point was insufficient. He may have gone through suffering, but Sunday essentially challenges him by asking if he was prepared to do what Sunday himself had already done. Is the Problem a Problem? In this response lies the answer to the question of evil in the world. Has anyone ever experienced suffering in the way that Jesus Christ did on the cross? Has anyone had that experience of taking on all the sin of the world? The answer to those questions has to be negative. None of us have ever had the experience of being the morally perfect victim punished for a crime that we didn’t commit. Therefore, we undoubtedly can drink our own cup that very well can be full of suffering, but our cup pales in comparison to the one that Jesus Himself handled for you and for me. What right do we have to than complain about anything? We can say that God doesn’t understand, but in reality, it is the other way around. Our human minds cannot comprehend the degree to which Jesus Christ suffered on the cross for each one of us. We cannot comprehend what it must have felt like to have the weight of all of the sin of all of humanity of all time on our shoulders. Soul-making therefore doesn’t seem to be the chief way that Chesterton attempts to explain the problem of evil. If it was, then it seems like Sunday would have simply agreed with Syme and moved on. However, that was not how the answered the question. Instead, he treated him very much like God treated Job. Until you are in the position of God Himself, your perspective on suffering is insufficient. God never really told Job why everything was happening to him in the way that it did, but He practically reminded him that He was God and that should be enough. The problem of evil is undoubtedly a problem for the Christian, but it is only a problem for those who are determined to understand every reason. Chesterton does not seem to be as concerned with providing some type of absolute reason. He doesn’t ultimately assume that God must be allowing things to happen for the development of one’s soul. He doesn’t want to put God in the box which is a theme that is prominent throughout all of Chesterton’s written work. He preferred to be in wonder of how God worked. Interestingly, this is not the product of pure anti-intellectualism or something much more nefarious like that. Rather, Chesterton understood his place in the universe, and even when we think we understand God perfectly, we very well might not. Our conceptions can only put God in the box, so we do our best to understand all that we can, and from what I understand, Chesterton defends a variation of the free will defense in other works. However, that being said, humility is a large part of understanding the problem of evil. We try to understand why God might allow certain things to happen, and there’s nothing wrong with that. However, Chesterton’s corrective through The Man Who Was Thursday reminds us to focus on what is truly important. Our suffering pales in comparison to what God Himself willingly entered into, and that ought to tell us something about the problem of evil. God is with us even in the dark times and therefore the problem of evil fails based on the character of God. G.K. Chesterton, The Man Who Was Thursday: A Nightmare (London: Penguin Books Ltd, 2011), 156, Kindle Edition. Noah ultimately was thankful for God’s provision as the end result of being faithful. At the end of the day, we have been talking about how important it is to remain faithful to God despite the fact that the world may not understand or maybe very countercultural. We have to remain faithful even though it may seem that evil is more profitable in the short-term. I think that sometimes we forget this final step in the process. We might be living in an evil times, and we might even stand strong to resist the temptation towards evil. At the end of the day though, we need to remember that thankfulness and gratefulness have to be in our hearts. Look at what happened when Noah left the ark. “Then Noah built an altar to the Lord and, taking some of all the clean animals and clean birds, he sacrificed burnt offerings on it” (Genesis 8:20, NIV). We need to have the same attitude of being thankful when we have come through such evil times and difficult trials. After all, it would be much easier to just throw up our hands and say that everything was for nothing. I find it is much easier to be ungrateful than it is to be grateful. 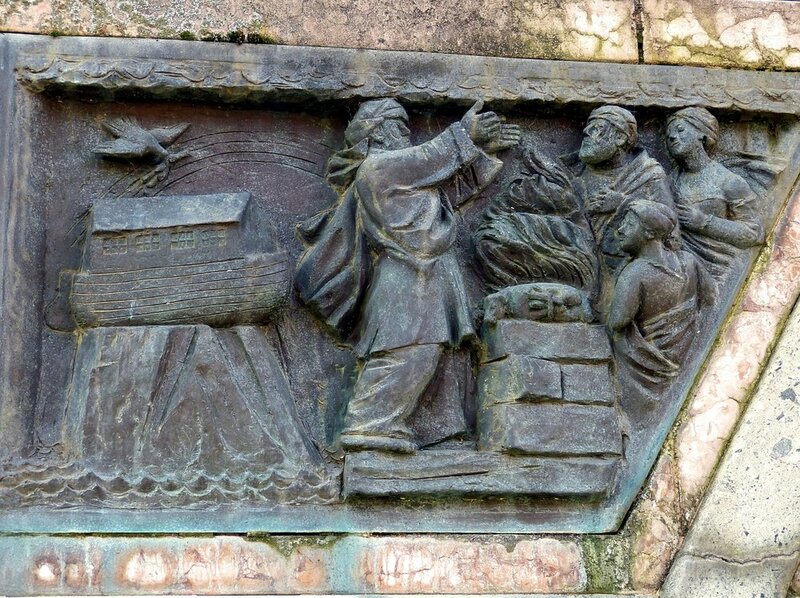 Even though Noah had been providentially saved, I have a feeling he probably could have found plenty of things to be upset about after spending all that time in the boat. He could have been bitter about why God did what He did. However, at the end of the day he made the choice to be thankful. This reflects back on the proper view of who God is and what God does. We can be bitter about having to live in such horrible times. Noah easily could have rejected God for having him live in such a time that he had to witness so much evil before his ultimate deliverance. He could have been upset about having to deal with the inconvenience of ridicule. He could have been upset about presumably having to put his entire life on hold in order to build a giant boat. Nevertheless, at the end of the day, he remained thankful. He continued to follow God (albeit imperfectly as we will soon find out), but we find him listed later in Hebrews in what has been called the Hall of Fame of faith. I don’t know that the days we live in are as bad as the days of Noah. They are pretty bad, and there’s plenty of evil to go around, but I really don’t know how I could ever compare which days are more evil. The point that we need to remember is that living in an evil time does not give us the excuse to be evil, we need to remain faithful and we need to be thankful at the end of the day. If we do these three things, I think that will help us stay on the right track which is of course God’s path for us. 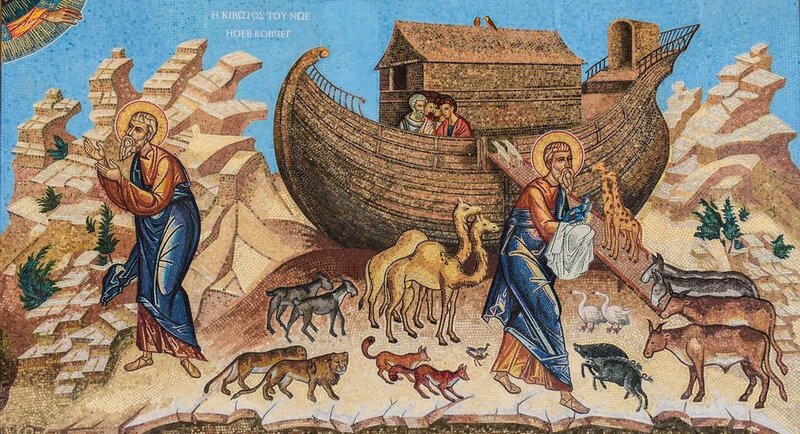 As we think about the time of Noah in comparison to the world of today, we have to remember that, despite the fallenness of the world around him, Noah was faithful. God told him to do something that was pretty radical. In a world that had never experienced rain, he was being asked to build a boat. They would seemingly be no reason to do such a thing. All prior experience would have led know what to believe that there was going to be no flood. After all, nothing like that had ever happened before. However, all that we hear about Noah’s response is really all that is important. “Noah did everything just as God commanded him” (Genesis 6:22, NIV). It can be tempting to compromise our principles in a world that is going crazy. After all, if everybody else is doing it, we sometimes think that it is okay for us to do it too. If it seems to work for them and they don’t really seem to be any consequences bad actions, it is easy for us to lose our resolve and compromise. After all, as we spoke about on Monday, our human propensity toward doing that which is wrong and rebelling against God has not changed. I spoke about Syria on Monday. I wrote about how it was horrendous to see the abuse of power evident when a dictator releases chemical weapons on his own people, including nonmilitary civilians and children. The wrong conclusion to draw from that type of action is that it is suddenly okay for other world leaders to be doing the same thing to their people. After all, if Syria can do it, why can’t another country do it? The right conclusion to draw from this tragic event is that, regardless of how you feel about the action taken by the United States, England and France intervening in this situation, using chemical weapons on your own people is objectively wrong. There are of course, in any conflict, casualties expected, and weapons of various types are going to be used. However, watching children and other civilians as the victims of such attacks is something that I believe we can agree on as evil. I think the circles back to my previous point. We want to make sure that we do not do that which is evil just because other people may be doing it. We want to do as God commands whether or not it appears profitable, popular or socially acceptable. Like Noah, we need to hold on to our righteousness because it is important, and doing what God commands is what we ought to actually spend our time on. It may look crazy, and people may not understand. The choices we make maybe incredibly countercultural. They might even be to our disadvantage in the eyes of the world, but, it is important to do what God says right away. After all, if Noah thought that he could wait a few years before beginning construction on his vessel, it would have been too late. Following God needs to happen all the time.